The rapid growth of mobile devices continues to redefine communication and productivity in the workplace. As a result, BYOD programs— in which employees use personal smartphones and tablets for business purposes — have increased exponentially. In fact, Gartner predicts by 2017, 50% of employers will require employees to supply their own device for work purposes (source: “Bring Your Own Device: The Facts and the Future” Gartner 2013). A further study by Juniper Research concluded that by 2018, there will be more than one billion devices used in BYOD programs worldwide. With the dramatic growth we have seen in the sales of mobile devices over the last few years, you are in a position where if you haven’t implemented a BYOD policy by now you could be allowing sensitive corporate information to be shared freely outside your organisation. Mobility drives productivity for CIOs and the business by increasing the number of mobile application users in the workforce. Rolling out applications throughout the workforce presents a myriad of new opportunities beyond traditional mobile email and communications. Applications such as time sheets, punch lists, site check-in/check-out, and employee self-service HR applications are just a few examples that can drive increase effciency. Expanding access and driving innovation will ultimately be the legacy of the Enterprise Mobility phenomenon. Mobile initiatives are often exploratory and may not have a clearly defined and quantifiable goals which can make IT planners uncomfortable. If you are offering BYOD, take advantage of the opportunity to show the rest of the organisation the benefits it will bring to them and to the business. While BYOD is occurring in companies and government agencies of all sizes, it is most prevalent in midsize and large organisations ($500 million to $5 billion in revenue, with 2,500 to 5,000 employees). BYOD seems to be the instigator of this shift and also permits smaller companies to go mobile without a huge device and service investment. Adoption varies widely across the globe with companies in the United States twice as likely to allow BYOD as those in Europe, where BYOD has the lowest adoption of all the regions. In contrast, employees in India, China and Brazil are most likely to be using a personal device, typically a standard mobile phone, at work. In Australia, the picture is not as clear. Research suggests that only 7% of us have our phones supplied by our employers, but other research suggests that 79% of the firms involved did not offer any support for employees who used their own equipment. This alludes to a gap between business expectations and information security. With many industry experts concluding that Enterprise Mobility Management (EMM) is an inevitable shift in mobile workforce management, it’s critical to consider the potential impact of confidential data being left unsecured. Below we will take a deep dive into the latest BYOD trends we are starting to see, as well as the shift towards Enterprise Mobility Management that is taking place. Productivity, flexibility and remote working have emerged as the top three drivers of BYOD. Interestingly, 66 percent of IT managers said cost savings weren’t the driving factor when looking at BYOD. Cost-savings were more a by-product of a BYOD project, while productivity improvements are the core focus. In fact, the introduction of activity based working has meant that giving employees the flexibility to work from anywhere is actually a key driver for companies to consider adopting a mobility strategy. It really is important at the outset of any mobility project that you clearly define the goals with the business so there is no ambiguity about what you are trying to achieve. Up until now there has not been a headline-grabbing security breach related to mobile devices, even though a number of CIOs were positioning BYOD as a large threat to corporate assets. With BYOD now encompassing tablets and PCs which will also have access to valuable corporate data companies need to ensure that their BYOD security tools are up to scratch. 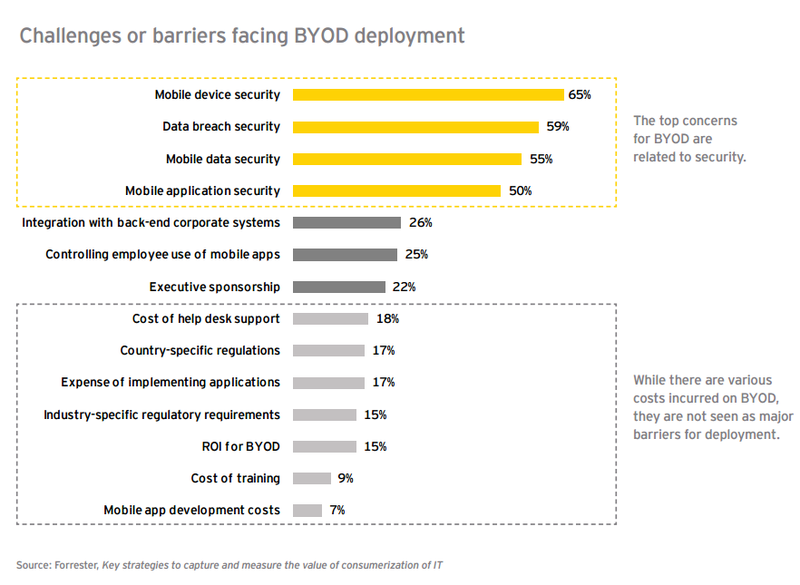 If you look at the below graph from Forrester, you can see that the top concerns for companies implementing BYOD are still focused around the security element. With that in mind, we expect to see the players in the MDM & EMM space to continue to invest and market their solutions around security as this is an area of concern for most customers. Your company’s biggest challenge will finding the right balance between ensuring your data remains safe and still provide the flexibility your employees demand. 3. Who Pays & What’s the Policy? Remember when your company reimbursed you for home Internet? This may be coming to an end. Signs already point to BYOD going the same way, especially in areas where jobs are sparse and companies aren’t under pressure to provide perks. In 2015, we might be saying goodbye to device reimbursement and monthly stipends for mobile service. 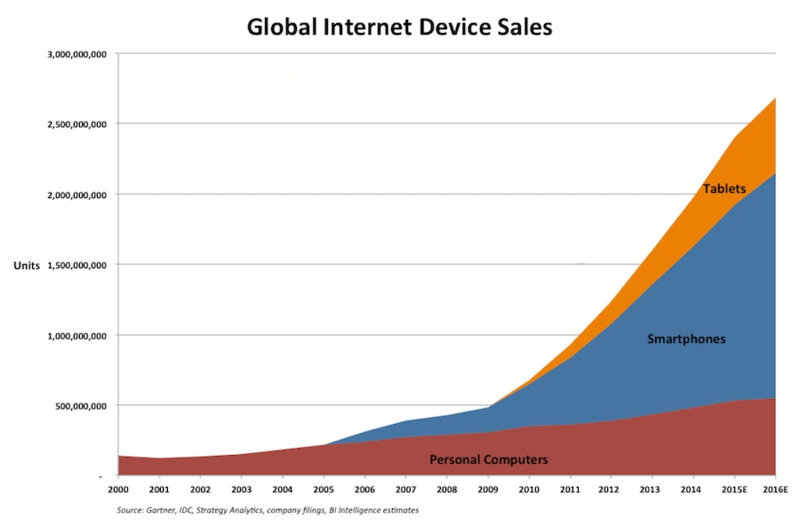 And if Gartner is to be believed by 2017 we may be all needing to supply our own devices for work. It will be interesting to see how this plays out and whether all the costs will end up with the user or if the business will continue to pay for the business related work on their mobile devices. With only 28% of organisations having a formal policy in place around mobility in their workplace this ambiguity can lead to unhappy workers. It needs to be very clear who is going to foot the bill for BYOD and companies should all have a very clear mobile use policy that is recognised throughout the organisation. CIOs have worked hard to change the culture from one that put up roadblocks (the department of “No”) to one that embraces change. Tech leaders have made big strides, and IT saved itself from becoming irrelevant. However, there is still a lot of work to be done with Enterprise Mobility security and policy. However, there is still a lot of work to be done with enterprise mobility security and policy. A lot of IT departments are being dragged down the Enterprise Mobility path and then asked to make it secure after the fact. 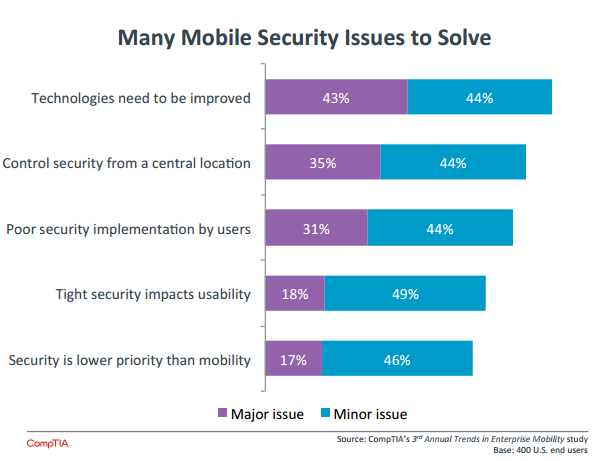 If you look at the below chart from CompTIA you can see how IT still has a number of security issues to tackle when it comes to enterprise mobility. Mobile device management (MDM) was all the rage a few years ago and now we are seeing the rise of Mobile Application Management, application wrapping and other related tools. What this has lead to however is over 160 MDM tools in the marketplace and an almost overwhelming amount of new companies sprouting up every day. Gartner predicts however that by 2019 we will see a large consolidation of all these companies and a few true EMM providers emerge. It is expected these providers will have a broader set of tools to help address an organisation’s entire mobility needs. EMM can act as the foundation for any successful mobile-first strategy, and is in high demand among many leading organisations. The benefits to be gained by a more comprehensive approach such as EMM mean it should be a focus for organisations in the future. However we recommend that any investments you make today in MDM, EMM etc are only a 12-24 month commitment as a lot is expected to change in that timeframe. One of the great inhibitors to BYOD initiatives is legacy applications that have browser dependencies on older versions of Internet Explorer, for example, or are locked up behind the firewall and not easily accessible. Employees are fed up with apps that chain them to the desktop. Instead, they want to use their shiny new iPads and Android tablets that they unwrapped over the holidays for work. 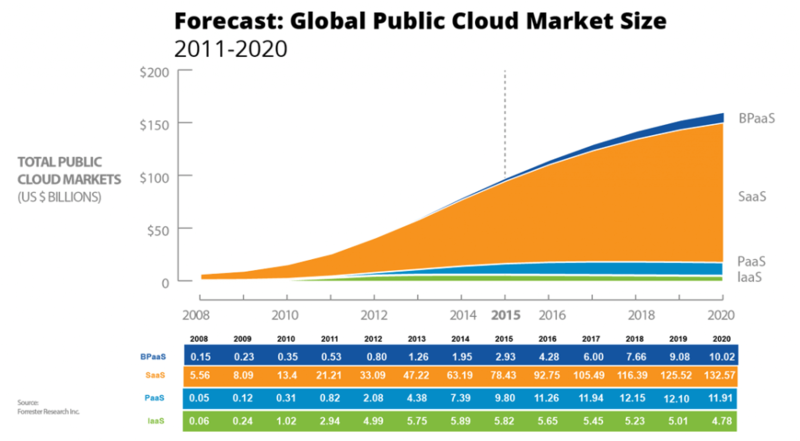 Couple this with the explosion of SaaS applications predicted over the next ten years and the need for in-house legacy apps almost completely disappears. This is particularly relevant to the mid-market space where IT budgets aren’t as large as you would find in your large corporate enterprise. For mid-size business, SaaS removes the headache of purchasing and maintaining expensive hardware and enables IT to let the business choose the apps that suit them best. The real key take-away from this post is that BYOD is already upon us and your organisation will need to make some key decisions as to the future direction you will take in this space. Our recommendation is you start with a solid BYOD security policy and build out your Enterprise mobility strategy from there. You also really need to perform an internal mobility audit to clarify what benefits your business wants to achieve from its mobility endeavours. It’s not enough just to roll out an MDM tool and think that this solves all your problems. You really need to understand what it is you want to gain from Enterprise Mobility and work back from there. Is the focus productivity & flexibility or is it cost savings? Whatever your goals are we recommend that you define them early and stick to them. 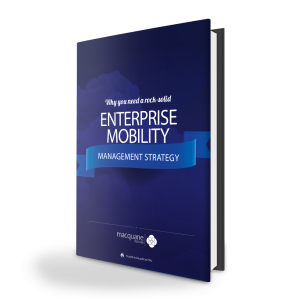 You may also be interested in downloading our guide below which contains best practices for adopting an enterprise mobility management strategy, and has some great tips on where your organisation can get started. Want to learn more about how Macquarie Telecom can help your business implement an Enterprise Mobility Management Strategy? Contact us at 1800 004 943 or submit an online enquiry for assistance.